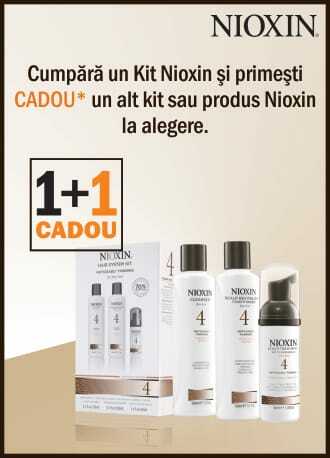 Buy one Nioxin Kit and you will get ONE FREE*! * The product that you will receive as a gift must have the same value or less with the purchased product. This special offer is available between 01.10 - 30.11.2015 for all El Studio Salons and on El Studio Shop. BioAmp: glycol-proteins that are designed to add thickness and strengthen the hair from inside the cuticle. Cystine acids work to seal the cuticle and help repair damaged fine hair. SmoothPlex: a proprietary blend of silk amino acids and kukui nut oil that adds moisture, natural shine and smooth control to medium to coarse hair. Glyco-Color Shield: dual protection technology protects your scalp from damage and irritation caused by chemical services such as highlights, lowlights, permanent waves, and relaxers, while preserving your hair color. Transactive Delivery System: time-release system that is formulated with vitamins, moisturizing nutrients and botanicals. Nioxin is designed to provide a healthy scalp to give your hair the best possible foundation from which to grow. Just like the health and look of your face is greatly dependent upon using the right products and cleansers, the look of your hair will significantly improve if you are properly caring for your scalp.